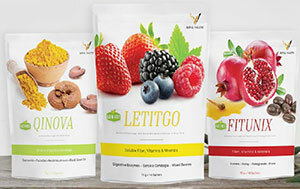 OEI Corp operates in the personal care and nutritional supplement MLM niches. The company is based out Malaysia and headed up by co-founders Jaswinder Kaur and Gurdev Singh (Chairman). Kourosh Sharifirad serves as OEI Corp’s CEO. Unfortunately the corporate bios of OEI Corp’s executives reveal nothing about them. Instead each bio is little more than a marketing spiel for the company. The same names are cited as management for OEW Group, which appears to be OEI Corp’s parent company. All three OEI Corp executives have been with the company for a number of years. As far as I can tell this is their first MLM venture. For reference, the “OEW” in OEW Group stands for Ortus Expert White. The “OEI” in OEI Corp stands for Ortus Expert International. OEW Group, as Ortus Expert White Pte Ltd, appears to have been in business since 2009. OEI Corp seems to have been launched on or around December 2017. Read on for a full review of the OEI Corp MLM opportunity. OEI Corp markets personal care and nutritional supplements through their Royal Valens and Royal Esence brands. OEI Corp’s Royal Valens nutritional supplement line is marketed as “holistic wellness to detoxify, nourish & energize your body”. Each Royal Valens variety is sold as a 14 day cleaning plan that targets the digestive system. OEI Corp’s compensation is a hybrid binary/unilevel. Additional performance-based bonus pools are also on offer. There are eight affiliate ranks within the OEI Corp compensation plan. Note that the Social Manager rank must be obtained prior to Pristine Director qualification. Given PV requirements drop from 800 to 40 over these two ranks, I believe once achieved, Pristine Directors no longer need to maintain Social Manager qualification criteria. Although retail pricing is provided on the OEI Corp website, they aren’t mentioned in the company’s compensation plan documentation. The OEI Corp Polciies and Procedures references a “Business Partner price” (wholesale), so I believe retail commissions are paid as the difference between retail and wholesale pricing. The 20% level 1 commission rate paid via residual unilevel commissions suggests the retail commission rate is probably also around 20%. Each OEI Corp affiliate that signs up must purchase an affiliate pack. 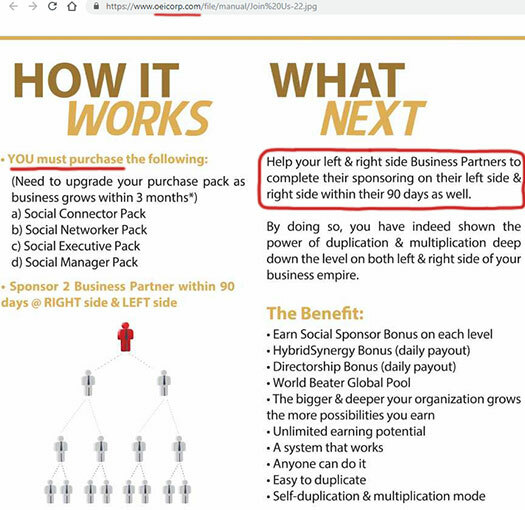 The coded-nature of the recruitment commissions means that if less than 40% is paid out, the system searches upline for a higher ranked affiliate. Once found, they are paid the difference at their rank. If the 40% still hasn’t been paid out, the system searches higher till a Social Manager is found and what’s left of the 40% commission is paid out. Note that as Social Managers are initially paid the full 40% across all pack levels, no coded bonus is paid out on their recruitment efforts. Also note that although not explicitly clarified in OEI Corp’s compensation plan documentation, I believe Pristine Director and higher ranks are paid the same as Social Managers. Social Connector to Social Manager ranked OEI Corp affiliates are paid residual commissions via a unilevel compensation structure. Residual binary team commissions are paid weekly as a percentage of matched sales volume generated on both sides of the binary team. Pristine Director and higher ranked OEI Corp affiliates are paid both binary and unilevel residual commissions. Residual unilevel commissions are paid out as a percentage of sales volume generated on up to 7 unilevel team levels. Note that to maintain binary commission payouts, Social Manager qualification criteria must be maintained. The OEI Corp compensation plan references a Key in Bonus, State Bonus and Company Global Pool Bonus. The Company Global Pool is awarded to World Beater ranked affiliates who maintain Social Manager qualification criteria. OEI Corp don’t disclose the percentage of company-wide sales volume the Company Global Pool is made up of. Pricing for these packs is not provided on the OEI Corp website. In addition to bundled products with each pack, the primary difference between them is instant rank achievement. I believe a Social Connector pack is required at a minimum, after which higher compensation ranks can be qualified for via PV. My first run through OEI Corp’s compensation plan led me to believe affiliates were either paid binary or unilevel residual commissions. This made sense as the monthly PV requirement from Social Manager to Pristine Director drops from 800 to just 40. Those who achieve World Beater (WB) with SM or 800PV equivalent, will enjoy the Bonus of Company Global Pool on a monthly qualification basis. This suggests that Social Manager qualification must be maintained to receive the Company Global Pool Bonus. The only reason I can see a requirement for that is to continue to earn residual binary commissions. The problem though is if an affiliate is maintaining Social Manager rank, they’re maintaining at least 800 PV a month – automatically satisfying their Pristine Director and higher PV requirements. Granted there is other qualification criteria at the Director ranks, but it just seems strange to include PV. I suppose at Pristine Director and higher binary commissions are optional, so one can choose to continue earning them or not by satisfying Social Manager rank qualification. Bit of an interesting twist on residual commissions and something I hadn’t seen before. Unfortunately the rest of OEI Corp’s opportunity isn’t up to standard. Problems begin with the nature of how OEI Corp affiliates are advised to build their business. As above, which is taken directly from marketing material on the OEI Corp website, new affiliates are told they “must” purchase a pack. They’re then advised to recruit two others within 90 days who do the same. This continues to duplicate, and over time you build your OEI Corp business. Nowhere is retail sales mentioned or featured as a component of the business. And the absence of retail commissions in OEI Corp’s compensation documentation didn’t go unnoticed. I’m going to go out on a limb here and say that the majority of monthly PV requirements for OEI Corp affiliates is likely satisfied through autoship, as opposed to retail sales. For an MLM company this is a problem. 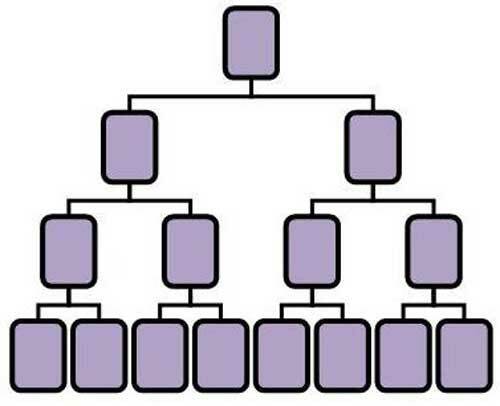 If the majority of sales volume generated company-wide are affiliate orders (autoship or otherwise), that MLM company is operating as a pyramid scheme. Another regulatory compliance problem is “pay to play”. OEI Corp affiliates choose their commission rate by paying more for an affiliate pack, thus rewarding affiliates who spend more. Tying commission rates to affiliate spend encourages inventory loading, where product is purchased to qualify for higher commissions as opposed to genuine need. OEI Corp appear to have already received some pushback on this, as evidenced by a November 8th video uploaded to their YouTube channel. People hear MLM & start running away! Are you one of them, haunted by the whole system? PONZI/SCAM/CHEATING/MONEY GAME/FRAUD/PYRAMID SCHEME is all you hear???? So, what really is the problem here? Is MLM really all about what the taboo says? Watch & judge for yourself! Unfortunately the video in question fails to address any of the concerns I’ve raised above. Instead CEO Kourosh Sharifirad spends most of the video urging viewers to put aside preconceptions of MLM and sign up as OEI Corp affiliates anyway. As far as OEI Corp’s products go, they seem to be an improvement over what was offered through OEW Group. Although it doesn’t appear to be sold anymore, at least not through OEI Corp, I feel obligated to point out a regulatory warning issued in Singapore last year. 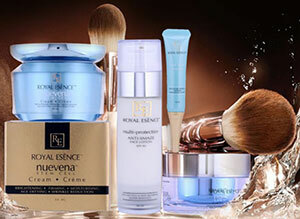 Prior to the launch of OEI Corp, OEW Group marketed Royal Expert Whitening Cream. In May 2017 the Singaporean Health Sciences Authority issued a warning against Royal Expert Whitening Cream. The regulator claimed testing revealed the product contained “3000 times the allowed amount of mercury”. It alerted the public not to buy or use Royal Expert Whitening Cream and instructed sellers to remove all listings. HSA advised those who have bought the product to stop using it immediately and throw it away. Dealers are allowed to distribute their products only in Malaysia. This is not a new issue as there (have) been many counterfeit and imitation Royal Expert products in the market, and we have taken all the necessary steps to curtail this issue. As far as I can tell, there was no indication in the HSA warning that the OEW Group products tested were counterfeit. OEI Corp still sell a skin whitening cream through their Nuevena Stem Cell cream. Whether the mercury level issue has been addressed or not I can’t say. I did find OEI Corp’s response to the HSA warning to be somewhat concerning however. The only acceptable response would have been to confirm their products don’t contain harmful levels of mercury, and if so acknowledge the fault and stop selling the product altogether. I did note that OEI Corp website states the company expects ‘to fuel rapid growth in the Malaysian, Indonesian, Indian and South African Market in the near future’. No idea on what the regulation for mercury in skin care products is in Malaysia, but if OEI Corp haven’t addressed the issue it’s likely it’ll resurface sooner or later. As a potential consumer I’d find that worrying. The rest of OEI Corp’s product lines seem above-board. Nothing particularly stood out but there was decent synergy between what was offered. Rather than go for a broad “we hope something sticks” range, OEI Corp have a smaller targeted range, making it an easier sell for affiliates. That is if the affiliates are focused on retail sales, which going by OEI Corp’s compensation plan and marketing material, for the most part I don’t believe is the case. First and foremost OEI Corp need to rework their compensation plan, specifically how affiliates sign up. Abolish tying higher spend packs to commission rates and instead have everyone start at the Social Connector rank. Split higher rank required PV between affiliate revenue and retail revenue (50/50 or higher), and go from there. Until those issues are addressed at a minimum, the OEI Corp MLM opportunity leaves a lot to be desired.